The National Association of College & University Food Services (NACUFS) recently issued its annual awards, and among the winners was Unity College for its sustainability efforts in campus dining. As reported by The Bangor Daily News, Unity was chosen as the winning submission in “waste management” in the NACUFS’ Sustainability Awards for minimizing waste sent to landfills and maximizing recycling efforts across campus dining services. The college examined the impacts of dining on its campus footprint, and decided to address specifically the amount of waste generated from food, plates, napkins and disposable items provided at campus events. A core component of the initiative are reusable to-go containers to be used in campus dining facilities. An increasingly popular choice for campuses seeking to decrease their footprint, reusable takeout containers are helping campuses cut both food and container waste. The results of the initiative have been significant with the college diverting an estimated 26.6 tons of organic waste from landfills over eight months between August 2016 and March 2017, and raised the overall campus diversion rate from 37% to 47%. Unity’s dining services began its sustainability initiative by purchasing 100% BPI certified products all of which can be placed in organics collection bins, removing any recycling guesswork for students and staff. The college also purchased new collection containers for events and updated bin signage to display instructional colors, messages, and images on sorting organic waste from trash. 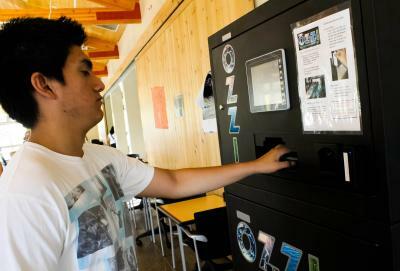 Costs for the sustainability initiative included the purchase of new organics bins and signage, as well as renovation costs to an existing storage shed that now serves as the college’s central collection site. The new organics recycling processes carry a marginal price increase over the college’s previous waste removal service, though the cost has been generally offset as the frequency of waste pickups decreased. Napkins made from recycled paper, and dispensers release napkins one at a time to reduce waste. Food waste is collected and utilized locally by AgriCycle Energy in Exeter Maine, which processes it into biogas in an anaerobic digester. Unity purchases 28% of its products from local sources, eliminating embodied fuel and transportation costs on these items. 80% of purchased products come from two Maine-based vendors, and the college’s primary vendor is committed to environmental practices. Reusable To-Go container program. Anyone can purchase containers and take their meal with them instead of using paper products. Dining services uses bulk products instead of PC (portion control) to eliminate packaging waste.